Did Mitt Romney flip-flop on TARP? By Louis Jacobson on Friday, May 18th, 2012 at 5:03 p.m. The Troubled Asset Relief Program -- the "TARP" program that was supposed to stabilize the financial markets -- has not been popular with conservatives. During the Republican presidential primary, most candidates attacked it. But the Democratic National Committee says Mitt Romney has flip-flopped on it. On Nov. 28, 2011, the DNC released two videos -- a 30-second version and a four-minute version -- that said Romney flipped on several issues, including TARP. About three minutes into the four-minute version, the word "TARP" appears on screen. Then Romney is shown in a split-screen view with Fox News’ Neil Cavuto. "TARP got paid back and it kept the financial system from collapsing," Romney says. "So you feel it was well worth it?" Cavuto asks. "Well, it was the right thing to do," Romney answers. Cut to another video clip, and we hear Romney say, "TARP ought to be ended." Rewind, then again, "TARP ought to be ended." Sounds contradictory, right? We checked it out. A fact sheet provided by the DNC tells us the source of the video clips. The first thing to note is that the statement in which Romney appears to support TARP was made after his "ought to be ended" clip. So does that mean Romney was originally against TARP, and then he was for it? Not exactly. We researched what Romney has said about TARP over the last four years and found that his position has largely remained unchanged. • In March 2009, Romney told Reuters, "The TARP program, while not transparent and not having been used as wisely it should have been, was nevertheless necessary to keep banks from collapsing in a cascade of failures. You cannot have a free economy and free market if there is not a financial system. … The TARP program was designed to keep the financial system going, to keep money circulating in the economy, without which the entire economy stops and you would really have an economic collapse." • A December 2009 clip shows how the DNC plucked the "TARP ought to be ended" quotation and distorted his position. His complete statement, in answer to a question by CNN’s John King about how to get the economy going, was, "And by the way, TARP has served its purpose. TARP ought to be ended. We've got hundreds of billions of dollars there that is being used as a slush fund by Secretary (Timothy) Geithner and the Obama administration. Stop the TARP recklessness at this point and get ourselves back to creating jobs by encouraging businesses to grow, expand their capital expenditures and hire." • In January 2010, Romney appeared on Fox and had even more positive things to say about TARP: "That was an investment made to try and keep a collapse of our entire financial system from occurring,"
• In a Republican primary debate in October 2011, Romney said, "My experience tells me that we were on the precipice, and we could have had a complete meltdown of our entire financial system, wiping out all the savings of the American people. So action had to be taken. Was it perfect? No. Was it well implemented? No, not particularly. Were there some institutions that should not have been bailed out? Absolutely. Should they have used the funds to bail out General Motors and Chrysler? No, that was the wrong source for that funding. But this approach of saying, look, we're going to have to preserve our currency and maintain America -- and our financial system is essential." 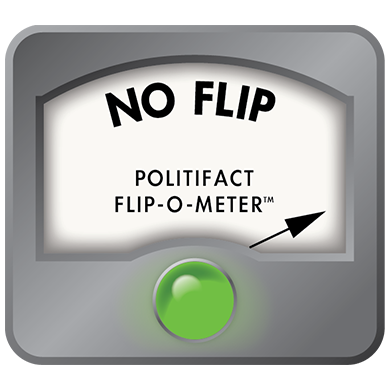 The DNC portrayed Romney as having flip-flopped on his support for TARP. But the statements the DNC chose for the ad echo what Romney has said on the topic all along -- that a Wall Street bailout was necessary to prevent a financial calamity, but the way the money was administered was poor. We rate it No Flip. Published: Friday, May 18th, 2012 at 5:03 p.m.